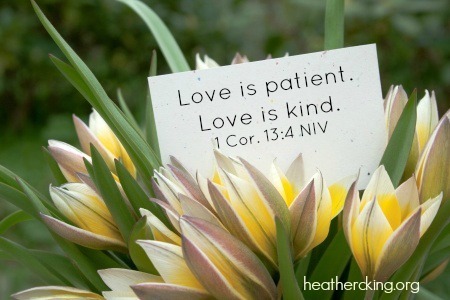 When I was a girl earning my badges in the kids’ program in my home church, I had to memorize the whole chapter of 1 Corinthians 13 in the King James Version. It’s stuck. I can still rattle off bunches of it. Father, Your love for us doesn’t fail. You just never give up on us. Thank You for that unfathomable and astonishing love when we are so unworthy. We pray that our marriage will grow ever more beautiful each day, not fading, not failing. In every single season, we pray that You will help our relationship thrive. Teach us how to avoid the pitfalls in communication, in intimacy, in finances, in conflict, in friendship, in parenting and in every way so that we will always be putting on love, which binds every other virtue together in perfect unity (Colossians 3:14). 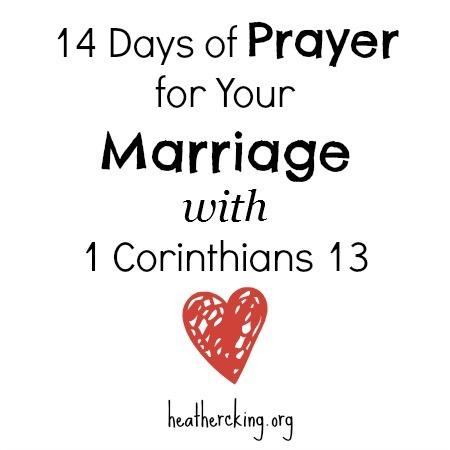 Will you join me in praying for your marriage for 14 days? If you would like a printout of these prayers to place in Your Bible or journal or maybe on your fridge or bathroom mirror, you can click here for the free printable! Thank you for the golden nuggets to pray. Going through a rough time right now, but God is faithful. His word is steadfast and true. I just need to take the time to constantly keep it in my spirit. I appreciate your work on the prayers. I’m so sorry to hear that you are going through a rough time, but thankful that you continue to see His faithfulness. Praying for you today! Love your prayer Thinhs are not great in my marriage my husband said he need space by to call him I’m in a long distance marriage it’s hurting me so much I’m praying things will chAnges soon .